Some women divers feel that the divers world is still too much a ‘boys world’. They even use the phrase ‘sexism in diving’. An American diving magazine http://divermag.com/sexism-alive-and-well-in-scuba-diving/ focused on this question in an article by Jill Heynerth an expert cave diver from the US, who interviewed some people and gave an overview of their reactions. ‘A woman boat captain and professional diver in the Caribbean told me, “When I used to drive the boats in, people would clap their hands if I docked in one smooth maneuver, yet if a guy did this it was considered average, routine’. ‘For women trying to find a gender-neutral diving context, there are some strategies that were offered. Women frequently seek out advice on ‘women-friendly’ operations and boats. They search for guidance on selecting appropriate instructors and sometimes specifically seek out other women as mentors and teachers’. ‘The good news is that women are slowly breaking down the doors to fully participate in action sports. They are challenging the masculine tradition, and demanding equal treatment and equal opportunity’. My reaction: the world of divers is the Sea. The French call it La Mer, a feminine noun, not to be confused with La Mère which is mother. The ancient Greeks called the sea Thalassa, the putative mother of Aphrodite who was born out of the sea's foam. Thalassa was not a personified goddess, but rather symbolised the essence of the sea. Well known was the powerful sea nymph, the silvery feeted Thetis, mother of Achilles. Some nymphs had a strong affinity with the sea, but lived on small islands. Like the mysterious Calypso with whom Ulisses spent several unforgettable years on his way back home. Not so nice was Circe, a witch-like character that brewed powerful potions. 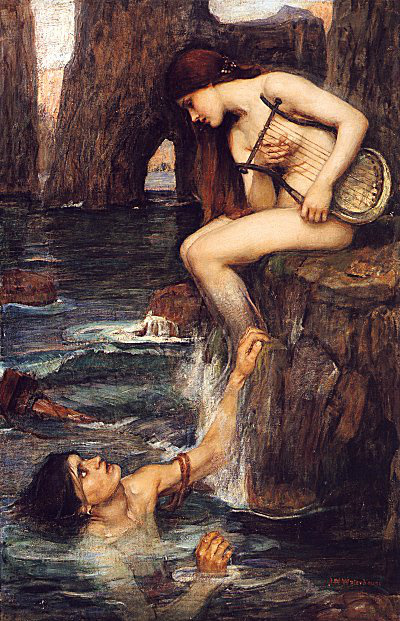 And the Sirens: beautiful yet dangerous creatures, who lured sailors with their enchanting music into shipwreck (see the picture above of a painting by John William Waterhouse, 1900). Sofar, the sea and its representatives have a definitely feminine touch! But of course the story is not complete. Because the ancient Greeks also worshipped the personified god Poseidon, mighty ruler of the Sea and Earth Quaker who lived deep in the oceans. Poseidon was definitely masculine (macho? ), tough and unforgiving against humans who provoked him. Poseidon was accompanied by the Nereids, and group of fifty sea nymphs who, in contrast with the Sirens occasionally helped sailors in trouble. The bottom line: men divers in general represent the Poseidon side, women divers the Thalassa side of the seas. Taken from a mythological perspective both sexes have intimate bonds with the Oceans. Which is probably the reason why they both feel attracted by the sea and eager to explore its depths.